T-Mobile’s launch of the HTC One S is hardly a secret as the company has already discussed their plans to launch the device. However, we haven’t heard much from them officially in terms of when the device may actually launch, though our own intel points to an April 25th release date. 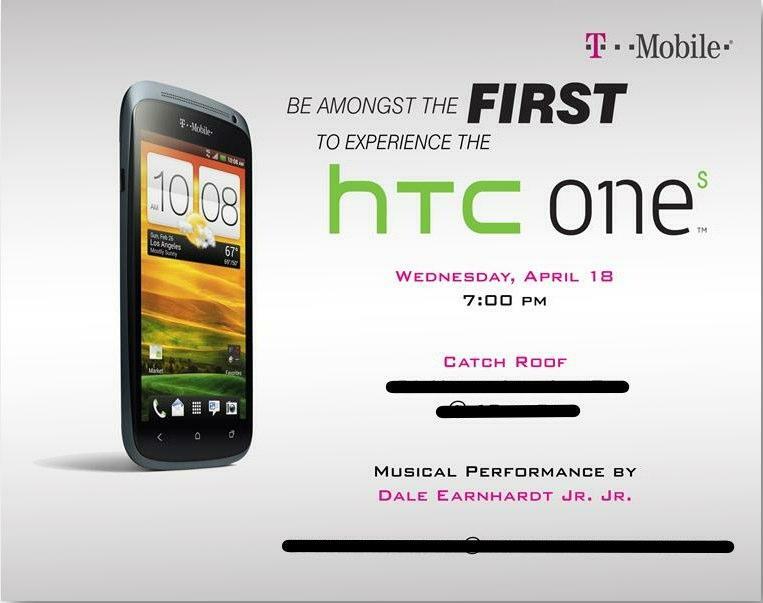 T-Mobile’s silence will likely end on April 18th as they’ve sent out press invitations for a special event happening in New York City featuring a musical performance by Dale Earnhardt Jr. Jr.
I’m going to do my very best to be in attendance and get hands-on time with the HTC One S. Either way, you, the TmoNews reader should be able to get your own hands-on time a week later if everything goes according to plan rumor. ← Lose Your T-Mobile Phone Around The House? Let It Scream. why does there have to be an event for this? cause this phone is bad a$$…!!!!! Simply put!! It’s mid tier at best… well, I guess that’s high end for tmo. it has the same processor as the ATT version. Only thing thats different is slightly smaller screen (which does not dictate high end and low end) and lower resolution which still isnt that bad. This mid tier phone, as you refer to it, is better than almost every phone on the market right now. The only difference is the hd display, wow. Please,tell me how this makes the phone mid grade? Meh …. I would have much preferred the X. Regardless I’m not getting anything until the SG3 is announced. I predict I will be leaving T-Mobile as I want a removable battery and an sdcard slot. They do have an SD slot, but bummer no removable battery though. Good Luck. it looks like all handset will eventually be going this route. The thinner they get the harder it is to have a removable battery. Only the Sprint version of the One X-Evo family has expandable micro SD storage. Neither the TMobile One-S nor Att One-X contain the expandable storage. Anyone know if re they going to make people upgrade their data to “4g” data for an extra $10/month for this phone like they did with the SGII? Does anyone know how to get around that? Why wasn’t that invitation made out to me? I want to get my hands on that One S! I thought that Dale Earnhardt Jr. was a race car driver, but then I saw another Jr at the end. I thought that would be Dale Earnhardt III. Either way, I wonder if he sings as good as his dad and grandpa races. Its not a he. It is a band out of Detroit and there is no relation to the Race car driver. That is even stranger…I guess I’ll have to check them out on YouTube and Wikipedia. Didn’t senior die or was that richard petty’s kid? I can’t remember. Nascar is super lame. F1, Indie, and everything else is cool though. So this was just a band making fun of redneck race car fans lol! I like them already! Can the event we’ve already had the event via you tube and other tech blogs that have posted hands on time and quadrant scores etc. Just release it on the 18th, seems like a waste of money to me. 21 Ninth Avenue, 4th Floor. New York, NY 10014? I can’t wait to compare this to my sensation in real life!!!! Unless you bought your GS2 on sale, there was never a requirement to buy into a heftier data plan. And even if you DID buy your GS2 on sale, you could have dropped down a data tier once you received your rebate. So I could have just gotten the phone, upped the data plan and lowered it back in a month? Do they really let people do this?! I believe I told you not to buy it…I don’t know anything about the company, but I can definitely understand why people would hesitate to buy from them. Also, make sure to post this in the right thread so people know! I got to hold this phone today. What a slick and elegant device. I want one badly. Can you post pixs taken from that phone in this forum? i don’t support mediocrity…HTC ONE X OR GTFO…!!! This comment is right on, can’t wait for the new.S4 chip to be in my next phone. Getsome, you shouldn’t call someone dumb until you learn the difference between your and you’re. I’ll close with this… You’re dumb. Cant wait for this phone ….ima get my wife an unlocked HTC one S and I’m getting the HTC one x version unlocked for ATT which would work on Tmobile networks. But ….does the att branded one come with the same dual core chip like the S ? How things going randomnerd? Oh and what’s up TMOTECH…. And yes, the AT&T version of the One X is packing the same processor as the One S. Something to do with the new Krait processor having integrated LTE, I believe. I still can use this x on 4g Tmobile correct. After using amoled display devices like Nexus One, Nokia E7, and then the G2X, now iPhone, not sure what I’ll think of this display. Sounds like a great device with a display not to match it’s performance. I agree with you, I think this smartphone will do good for average users that doesn’t care what reviews are or someone telling them its a bad choice. It looks like a badass phone. #ontopic I think it a mistake for ppl to sleep on this phone. Laughing at everyone who doesn’t know Dale Earnhardt Jr. Jr. is just a band. What company should we avoid? Wrong thread. And that company has been around for some time. The few complaints on that site hardly justify your warning and that Davis should delete the article. Besides, in Google check out “complaint ________” and the name of any product YOU own or service you pay for. There will always be complaints from somewhere by someone. Quit being such a drama queen. Don’t patronize businesses you don’t like and leave it at that. What kind of warranty would this HTC one s have in some circumstances : dropped, water etc etc …. and knowing that it doesn’t have a removable battery what would you guys recommend ( TMOTECH, randomnerd) …?? If you purchase the T-Mobile One S, it comes with a one year warranty against defects. That doesn’t cover liquid damage or physical damage. So if you get the phone wet or if it gets cracks or other physical damage that isn’t normal wear & tear, that warranty is void. Note that if you damage the phone and you have insurance, there is a “deductible” involved to replace it. Probably $130 for the One S.